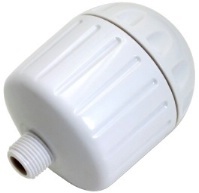 High Output white ABS plastic filter without a showerhead. Filter lasts roughly 1 year. Choose this option if you already have a showerhead you like or want to add an Oxygenics showerhead. Sprite High Output™ Shower Filters include a high-capacity (15,000 gallons or 1 year, whichever comes first) reversible, replaceable filtration cartridge for greater chlorine-removal capability that can last up to one year.